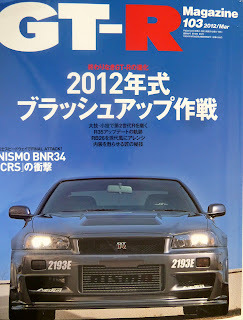 GT-R Magazine #103, March 2012. The Japanese put together awesome magazines. If you are a magazine junkie like I am, the Japanese books come in a large format, square bound, huge photos, and lots of cool features. On the cover this month is the Nismo R34, sort of a Z-Tune with R35 brakes, and injectors. If I could read more Japanese, I might understand more of what it is all about. At around 1300 yen in Japan, by the time you get the magazine here, it ends up costing about $25-$30, but worth it. In the magazine they list total Nissan R35 GT-R sales for Japan. The data is current as of December 2011. Since 2007, Nissan has sold 7035 Nissan GT-R’s in Japan. The following chart breaks down the 7035 total cars sold by model. US Total sales have been 5522 units. The most popular seller by far was the Black Edition. I wonder if the US had the Black Edition from the beginning, if we would see a similar sales percentage of Black Editions to Normal/Premium’s. Only 55 total SpecV’s sold. Only 14 EGOIST. The 7 Pures, that is just the new name for the base model. They managed to sell 1 EGOIST a month. Probably not worth the hassle. The current Japanese exchange rate, makes the selling price in Japan, on the Premium Edition about $10,000 more than the Black Edition. The Black Edition in Japan is less expensive because in Japan, it does not have the same wheels as the US car, or for 2013, it doesn't have the carbon fiber wing. Just the wing alone is around $10,000 from the Nissan dealer.